Super cute. Fairly sturdy. Looks great with ferns and drop and go arrangements. Easy to find decor to coordinate too. 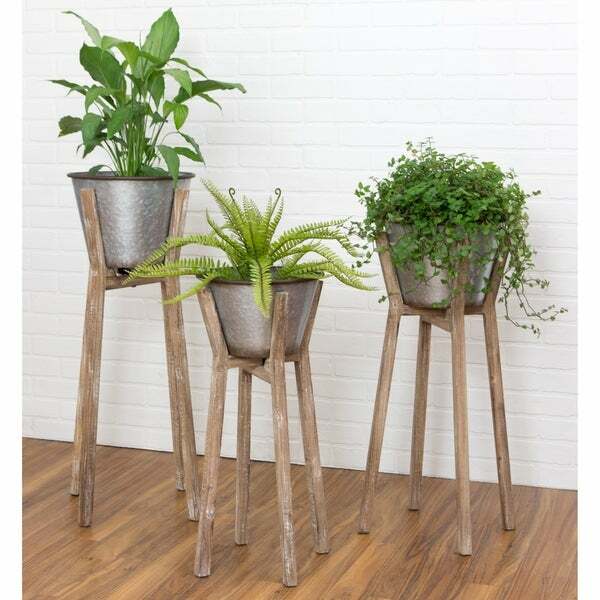 These handsome planters combine rustic looks with the sleek elegance of modern design. The round metal pots sit atop wooden frames with a distressed light brown finish. These are recommended for indoor use, but they can also be placed outdoors if kept out of direct contact with rain and harsh weather. Dimensions 17.0 In. X 17.0 In. X 35.0 In. I bought these planters and I am so happy with the quality! I have seen these at other stores that were definitely more expensive! You can separate them and use them all over your house indoors or outdoors! I don't think that anyone would. E disappointed in buying these planters! 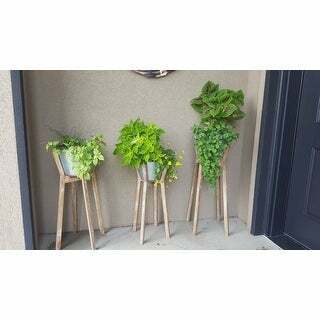 I used these rustic planters on my front porch. They are sturdy and beautiful. Get ready to receive many compliments on these farmhouse-style planters. These planters were a gift to my daughter. She absolutely loved the quality, size, and how solid they are. She lives in a farmhouse and they perfectly match her decor. 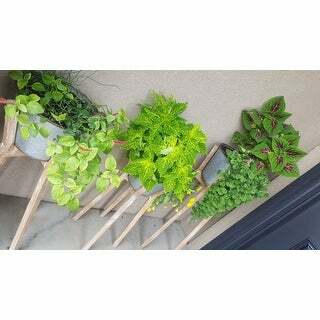 If you're looking for a quality, solid, versatile planter set, purchase these. they are easily assembled and ready to use right out of the box. Packed well but odd assembly with a screw into a preset socket and a pin with a chain into a hinge-like bracket to hold the pieces in a cross configuration. The hardware is black while everything else is light wood or metal which is a bit distracting. The photo instructions didn’t quite match the way the parts fit together but it was more like tinker toys than erector set level of difficulty. The finish being more sloppy than ‘country chic’ added to the cause for the missing star. Overall they’re attractive, a good size and height variety, look great w plants and the wood smells really good. Suspect the grumpy dog will knock them over eventually as they’re top-heavy: he’s not been overly curious. Bought these for my fiancé and she loves them. Just as pictured. Would recommend to a friend. 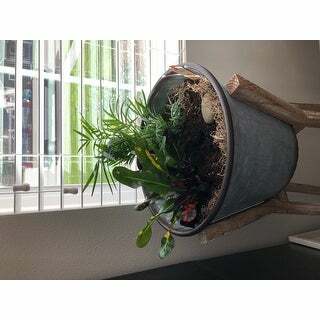 They are cute but you have to use a planter set inside buckets because the buckets leak. I thought they were solid by looking at the the picture. Well made, sturdy product. Looks very nice and gets my plants up off the floor. I did put plastic saucers in the bottom because it leaks due to my overwater spillage.With the saucers, I don't have to worry about it. I just sat the plastic pots inside. Wonderful! I get lots of compliments. They showcase my flowers perfectly. Love the height. They could be used for a county look or an urban/industrial vibe. So glad I bought these! Super cute but missing ALL hardware. Te reviews were good and they look really cool and will fit my decor.